This is gonna be a good life! We’ve been back on land for two days now and we’re all still adjusting to life on solid ground. I used to think that from my experiences as a kid on a sailboat, that I knew what it was like to live on a boat… that couldn’t have been farther from the truth. After two weeks on the boat we only just began to scratch the surface of what living in the field is like. It was like no experience I’ve ever had, and I will never be the same because of it. In attempt to stop you from thinking that this experience was anything less than incredible I will give you a little behind the scenes glance of what it was like, and how much fun we actually had. Our days normally started around 8:00 am in the galley for breakfast. After that we took care of our chores for the day which ranged from cleaning the decks and heads to acting as the navigator and mapping a course for the day. We were able to stay at some pretty amazing islands, like Jones pictured below. Since our days with whales were limited we collected a lot of physical oceanographic data from the CTD and other equipment like the Secchi disk which measures visibility in the water. We even had the opportunity to sample at one site for the entire day to see how the ocean changed at that one location over time.As the days without whales continued we became more creative with our data collection. It was in these days that we learned how far we were willing to go for our research. Phinn, one of the other students, decided to jump in the water every hour for 7 hours during the day to get horizontal secchi measurements as opposed to the usual vertical readings. After jumping into 8 degC water ourselves earlier that week this seemed absolutely crazy. Even so we jumped in again on a later day and swam around for 25 minutes. 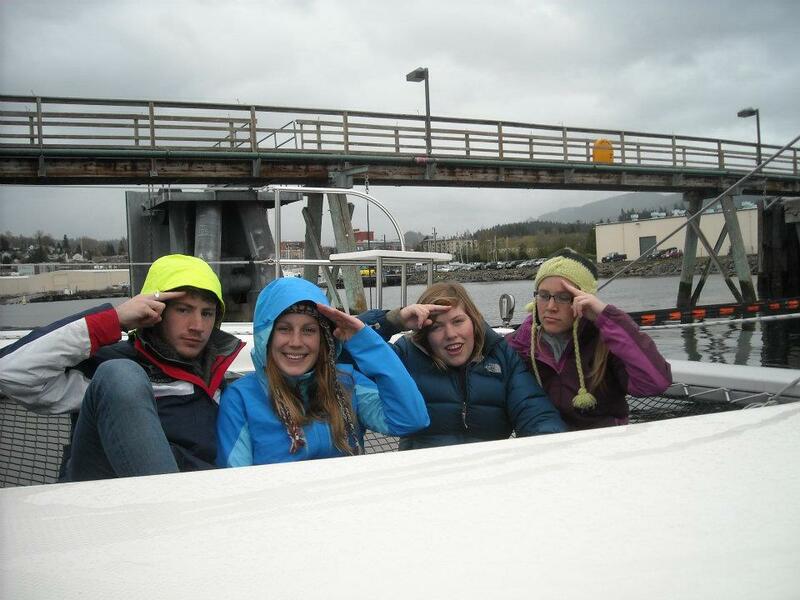 With the Olympic mountains in the background it was absolutely breathtaking… oh wait that was the water. After a week on the boat with no reports of whales we were getting antsy. We delved into collecting as much data as we could and in turn analyzing that data, which I am still doing. We were very successful in collecting a lot of data. 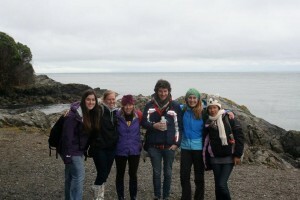 Finally we ran into some luck and heard of the whales coming in through the Strait of Juan de Fuca. Even though we woke up at 5:00 am to listen to hydrophones we missed them passing our anchorage and we had to play a bit of catch up. We eventually caught up to the whales and were able to collect both behavioral and acoustic data using the 4 hydrophone array. Suddenly our other needs became secondary and we adjusted course to follow the whales. We ended up having two more days with the whales as they led us from one end of the Salish Sea to the other. Our last day with them was amazing. We were with the whales for about 2 hours and witnessed some amazing behavior like spyhops, tail slaps, and even a few breaches. All of this set against the background of the sun setting on the horizon. While we had some struggles with adjusting to this life style it was an absolutely amazing experience that was hard to walk away from. 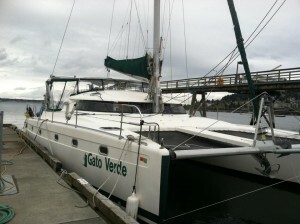 What made this experience so special was the boat we were on, The Gato Verde. This is no ordinary boat, it is the first plug in diesel electric hybrid charter boat on the west coast. Stretching to a luxurious 42 ft the Gato was an incredible home away from home. It isn’t special simply because of the amount of space aboard, but because the boat is a pioneer in the field of sustainable boating. Most boats have a motor that runs on gasoline that in turn powers the propellers which move the boat through the water, but the Gato isn’t like any other boat. Captain Todd Shuster added a diesel generator, and a large battery bank in order to make the boat more green. The generator runs on diesel which is cleaner and less explosive than gasoline and the battery banks helps create more clean energy. This would be all fine and dandy by itself, but the Captain took the extra step and taught us about why he made the changes to the boat and how it is creating more sustainable travel and less impact on the environment. As part of our course we learned about sailing and the different parts of the boat. We even had a knot tying lecture, I can now tie several knots including a reef knot, clove hitch, and cleat hitch. The cruise began with us as students learning about the different aspects of sailing and quickly turned us into actual sailors. We regularly helped raise the jib for sailing and deployed the anchor at nights when we were not on a dock or mooring buoy. We did not get much ideal weather for sailing but when we did we made sure to take advantage of the wind and put our mainsail up. Sailing is another example of how the boat is green. When we had ideal weather conditions we could take advantage of our environment, turn the motor off and use the power of the wind to move the boat. While docked one night we rested next to another sail boat that had a wind generator. This acts like a small turbine that harnesses wind energy and can be used to power the boat. Adding this to the Gato would be yet another way to make the boat more sustainable. One aspect of sustainability still being addressed is the issue of blackwater. Blackwater is waste water loaded with biological material like feces. Living on a boat we naturally accumulated black water that was stored in holding tanks since we could not just dump the waste into the ocean. It poses a danger to the environment due to the amount of bacteria and contaminants from human waste that are not naturally occurring in the ocean. So we had to pump out our waste at pumping stations like the one in Roche Harbor. While some aspects of living on a boat were challenging, like timing our location with our need to pump out our holding tanks, and living in such close proximity to people, this was the most amazing experience of my life. 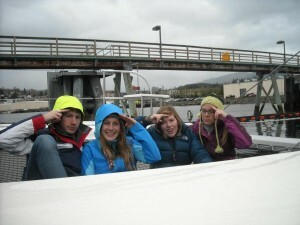 I learned so much about the Salish Sea and clean boating as well as about myself and just how far my limits reach. I am sad that our time on the Gato has come to an end, but now I get to analyze the results from all of the data we took and put my piece into the larger puzzle that is the Salish Sea. Data, sailing, and hand saws oh my! Wow! This is all I feel I can say to properly describe our first cruise on the Gato Verde this past week. It was absolutely incredible. We left the labs Monday morning practically chomping at the bit to get to see the Gato for the first time after hearing and reading so much about it. When we finally got there, to my surprise, the boat seemed much bigger than I thought it would be, which trust me when living with the rest of my class is a good thing. All of our weirdness would not fit into a small boat. After getting oriented to the boat we left and motored to Sucia island where we docked for the night. But as they say life’s not about the destination, its about the journey, which didn’t fail to stand true on the trip over. We all put our rain gear on and sat on the trampoline that stretched between the two hulls of the catamaran and were absolutely soaked by oncoming waves. It’s good to know that when REI tells you your pants are waterproof, they really mean it! One of the challenging things about living on the boat is that we have to cook our own meals and plan our cooking ahead of time. I can definitely say that my cooking abilities have exponentially increased since they were pretty much limited to frozen foods and pasta, oh and I make a mean bowl of cereal. Although, you should know that I am a bit like a 5 year old in that I dislike almost all vegetables and cooking for vegetarians means I ate a lot of vegetables. I could practically hear the 5 year old inside me throwing a temper tantrum, but I was amazed upon finding that vegetables aren’t inherently evil, they’re actually rather yummy. Now that my brain was properly fueled we learned about all of the science equipment we would be using and have available for our projects. Staying consistent with my shopping tendencies I was instantly fascinated by the CTD which measures conductivity, temperature, and depth, and happened to be worth roughly $50,000. Needless to say every time we deployed the CTD I had a miniature heart attack anticipating everything that could go wrong. After a day of collecting data on the CTD we realized that we weren’t actually recording any data. Robin finally realized that the ring around the start button was to protect the device during transit and was actually not a stylish accessory. We removed the ring and finally got successful data uploading from the CTD to the computer. After several deployments we got the hang of it and I am excited to start taking data for my project. Today we worked on our service project that we are required to complete for the course. 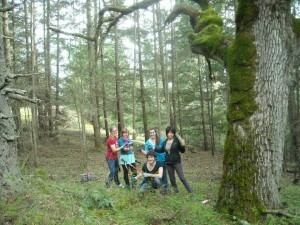 We decided to work with the San Juan County Land Bank and help with Garry Oak restoration on Cady Mountain. 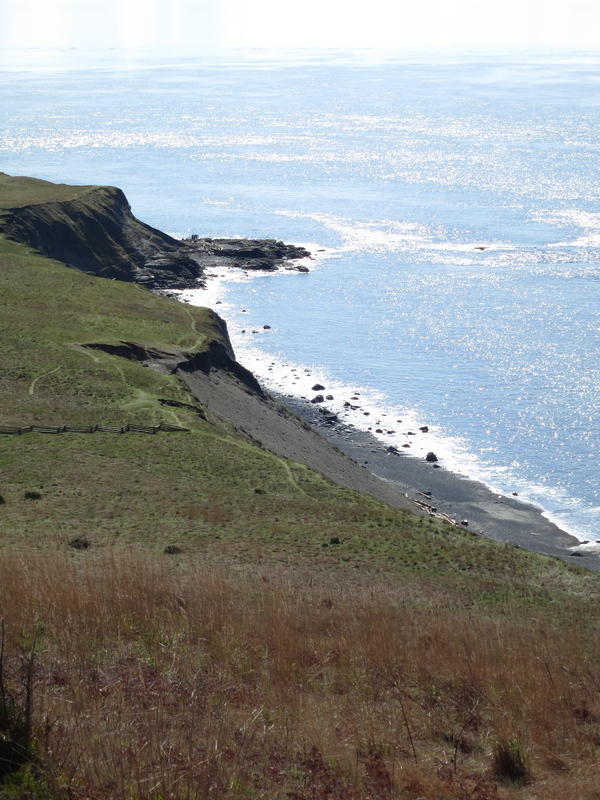 First we learned a little history about land use in the San Juans and the transformation the islands have seen since colonization. Then we took a trip to the Cady Mountain preserve to actually work hands on with Garry Oak restoration. We were able to help cut down trees to save trees… don’t think too hard about this it made my brain hurt. Actually, we were cutting down/ trimming other trees that were out-competing the oaks for sunlight. Don’t worry, we weren’t running through the forest willy nilly cutting down trees. We had a lot of fun helping to restore a beautiful area on the island while wielding really awesome ninja hand saws. I’m pretty sure it doesn’t get much better than that. This week we are writing our proposals for our projects and will be finalizing them by Sunday before we head back out onto the Gato on Monday for our 1 week cruise of data collection. Hopefully the whales will be more cooperative and actually be in the San Juans while we are as well. Either way it is going to be an exciting adventure complete with sailing songs, random fits of laughter, and a lot of Sriracha. So this week we were able to observe a harbor seal necropsy which is essentially a dissection but since we’re biologists we gave it a fun name. Once I got past the smell and the obvious fact that they were cutting open a baby seal it was fascinating. If you have a particular fascination with all things grotesque you can check out Rachel’s blog for a picture. Its pretty cool I’d check it out. While nothing could really compete with getting an inside look at a harbor seal it’s been a pretty good week. We’re preparing for our data collection at the Lime Kiln lighthouse and starting to narrow down our ideas for research projects, which is much harder than I initially though it would be, there’s just so much to ask. 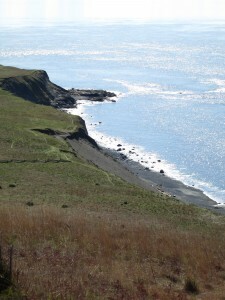 We also travelled to Mount Finlayson which was a bit of a hike, but totally worth it as it gave us a great view of cattle pass and the surrounding waters at the southern tip of San Juan Island. In the meantime we’ve been continuing our work in the classroom and combining our interests and the class theme of sustainability. We were responsible for finding another case study but this time about sustainable fishery practices which was right up my alley, being a fisheries major and all. So I looked at a paper titled Estimating mortality of Atlantic bluefin tuna in an experimental catch-and-release fishery. I think its a requirement that all research papers have an excessively long title. The paper looked at the potential to create a catch-and-release fishery to limit fish mortality. Studies have been done on why people fish and the most often reason is the social bonding experience. Often times its a family tradition passed down from generation to generation, so this way people can still have that experience while conserving the tuna population. The study sought to simulate the proposed regulations of the fishery to get results that would resemble what might happen on the boat. The researchers caught 60 fish and managed to tag 59 of them with PATs which are pop-up archival tags. These tags include microchips with a sensor, transmitter and float. They can measure temperature and depth and are preprogrammed to release from the fish and float to the surface after a certain amount of time or death of the fish. The results show that only 2 fish died, and 4 tags didn’t successfully transmit. The rest of the fish survived except for one. If you noticed earlier I said they caught 60 and tagged 59. So that one was killed during the fight after the fish was hooked. There was an overall mortality rate of 5.1% which is much better than 100% if I do say so myself. I think this is a terrific idea, but much needs to be done before it will be successful. I would love to see them do another study with a greater sampling range of at least over 100 animals to get more accurate results. This type of fishing would also take strong leadership on the boat and experienced anglers. However I love that people are trying to find ways to combine human and environmental interests so that we can enjoy the things we do now for a long time to come. A week has already gone by since we moved into Friday Harbor and we have been keeping busy with class and continuing our discussions on sustainability. In my reading I came across a really interesting paper called Sustainable resource management coupled to resilient germplasm to provide new intensive cereal-grain-legume-livestock systems in the dry savanna. Try saying that 5 times fast. Although it seems a bit daunting its a really fascinating concept. In sub-saharan Africa people are dealing with increasing populations and demand for products while still restrained by the arid climate. After years of research from the ITA (Institute of Tropical Agriculture) researchers found that farmers were hesitant to implement potentially costly technologies without seeing immediate economic profits. So the focus for the last 10 years has been on cereal-legume and crop-livestock systems where farmers make most of their money. After developing and testing several ideas researchers found the following to be most successful and profitable. They used promiscuous soybeans and dual-purpose cowpea lines which are more efficient at fixing nitrogen. Now don’t worry, its been a while and I wasn’t even sure about the definition of nitrogen fixation, I had to look up. It is the process of changing the structure of nitrogen in order to free up nitrogen atoms so that they can freely interact with other chemicals. This is important because nitrogen is needed to biosynthesize the basic building blocks of plants. So more efficient nitrogen fixation results in greater crop production. Another problem farmers are facing is a weed called striga which is killing their crops. A soybean they have been working with is able to bring the striga to premature “suicidal” germination. After implementing these two ideas on several farms, farmers saw immediate results. On average crops showed a $1,233 dollar increase per hectare of crop. I think it is very cool that scientists and farmers were able to work together and mitigate a specific problem using crops they already had. By understanding the properties of crops they were able to develop a rotation system to maximize profit. We’ve been continuing our work on sustainability but are now starting to branch into the research aspect of our course. Over the weekend we put together data sheets for gathering data at Lime Kiln this week and the next. 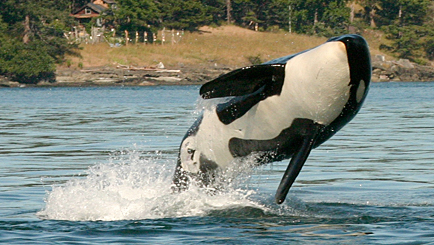 hopefully our luck seeing the Orcas will improve. At the moment we’re working on designing some sort of whale song and dance to call the whales to us, since telepathy hasn’t been working. Either way it’s going to be an exciting week at Lime Kiln. Ever since my freshman year I have been hoping I would get into the Beam Reach program and now that I have it feels slightly surreal. 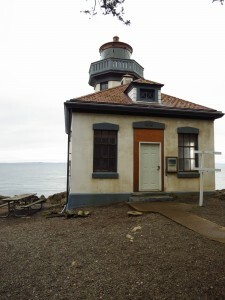 We moved in to the Friday Harbor Labs this past weekend and just began classes on Monday. We have only been here a week and it feels like I have known my classmates for much longer. 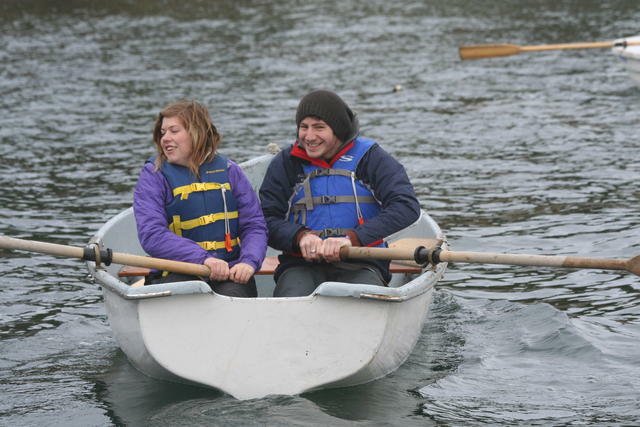 When not in class, which is a short amount of time, we have been exploring Friday Harbor, venturing to Lime Kiln, and even learning how to row in rowboats… sort of. I can already tell this is going to be an amazing quarter and I am going to be sharing it with some really awesome people. We have hit the ground running in class with discussions on sustainability and defining what it means to each of us. I have discovered that it is a very difficult concept to sum in a few sentences but I’ll give it my best shot. I feel that sustainability science is a science that investigates and promotes technology that combines human and environmental goals in order to sustain and preserve our natural resources for further generations. 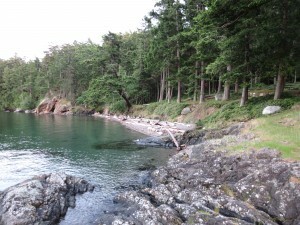 Here at Beam Reach we focus on marine science while practicing sustainability. We are committed to studying the resident killer whales while minimizing our impact on them by using a diesel electric catamaran for collecting research called the Gato Verde. We will get to go out on the boat in a few weeks for a test run up to Cherry Point and I cannot wait. This is going to be an incredible adventure, I hope you’re all enjoying life as much as I am.